Al-Abbas ibn Abd al-Muttalib (Arabic: العباس بن عبد المطلب‎, translit. 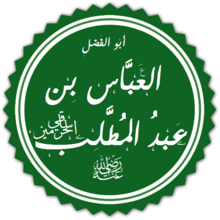 al-ʿAbbās ibn ʿAbd al-Muṭṭalib; c. 568 – c. 653 CE) was paternal uncle and Sahabi (companion) of Muhammad, just three years older than his nephew. A wealthy merchant, during the early years of Islam he protected Muhammad while he was in Mecca, but only became a convert after the Battle of Badr in 624 CE (2 AH). His descendants founded the Abbasid Caliphate in 750. Abbas, born in 568, was one of the youngest sons of Abd al-Muttalib. His mother was Nutayla bint Janab of the Namir tribe. After his father's death, he took over the Zamzam Well and the distributing of water to the pilgrims. He became a spice-merchant in Mecca, a trade that made him wealthy. During the early years, while the Muslim religion was gaining adherents (610-622), Abbas provided protection to his kinsman but did not adopt the faith. He acted as a spokesman at the Second Pledge of Aqaba, but he was not among those who emigrated to Medina. Having fought on the side of the polytheists, Abbas was captured during the Battle of Badr. He was a large man while his captor, Abu'l-Yasar, was small. The Prophet asked Abu'l-Yasar how he had managed the capture, and he said he was assisted by a person whom he described and Muhammad identified as a noble angel. Muhammad allowed al-Abbas to ransom himself and his nephew. Ibn Hisham says that Abbas had become a secret Muslim before the Battle of Badr; but the clear statement is missing from Tabari's citation of the same source. It is sometimes said that he converted to Islam shortly after Badr. It is elsewhere implied that Abbas did not formally profess Islam until January 630, just before the fall of Mecca, twenty years after his wife Lubaba converted. Muhammad then named him "last of the migrants" (Muhajirun), which entitled him to the proceeds of the spoils of the war. He was given the right to provide Zamzam water to pilgrims, which right was passed down to his descendants. Abbas immediately joined Muhammad's army, participating in the Conquest of Mecca, the Battle of Hunayn and the Siege of Ta'if. He defended Muhammad at Hunayn when other warriors deserted him. After these military exploits, Abbas brought his family to live in Medina, where Muhammad frequently visited them and even proposed marriage to his daughter. Later Abbas fought in the expedition to Tabuk. Abbas had at least five wives. Lubaba bint al-Harith (Arabic: لبابة بنت الحارث), also known as Umm al-Fadl, was from the Banu Hilal tribe. Umm al-Fadl claimed to be the second woman to convert to Islam, the same day as her close friend Khadijah, the first wife of Muhammad. Umm al-Fadl's traditions of the Prophet appear in all canonical collections of hadiths. She showed her piety by supernumerary fasting and by attacking Abu Lahab, the enemy of the Muslims, with a tent pole. Fatima bint Junayd, from the Al-Harith clan of the Quraysh tribe. Hajila bint Jundub ibn Rabia, from the Hilal tribe. Tukana, a Jewish woman from the Qurayza tribe and a former concubine of Muhammad, whom Abbas married after 632. It is not known whether any of the children were hers. Al-Faraa, who married Qatn ibn Al-Harith, a brother of Lubaba. Her mother is not named. Ubaydullah. Ubaydullah's daughter Lubaba married al-Abbas ibn Ali and had Ubaydullah ibn al-Abbas ibn Ali, who is the famous Ubaydullah ibn al-Abbas. Umm Habib. These seven were all the offspring of Lubaba. Al-Harith. His mother is variously said to have been either Fatima or Hajila. Aown, whose mother is not named. Mushir, whose mother is not named. Amina, probably the daughter of Musliya. Safiya, probably the daughter of Musliya. Tammam, the youngest, son of Musliya. Abbas died in February 653 at the age of 85. He is buried at the Jannatul Baqee' cemetery in Medina, Saudi Arabia. The Abbasid dynasty founded in 750 by Abu al-`Abbās `Abdu'llāh as-Saffāh claimed the title of caliph (literally "successor") through their descent from Abbas's son Abdullah. Many other families claim direct descent from Abbas, including the Kalhora's of Sindh, the Berber Banu Abbas, and the modern-day Bawazir of Yemen and Shaigiya and Ja'Alin of Sudan. and Awan, Sararra Abbasi of Abbottabad (Union Council Kukmang, Patan, and Boi) and Mansehra, Dhund Abbasi & Jasgam of Murree & Kahuta Pakistan. ^ al-Tabari, Muhammad ibn Jarir (1998). Tarikh al-Rusul wa'l-Muluk: Biographies of the Prophet's Companions and Their Successors. 39. Albany: State University of New York Press. p. 24. ^ Ibn Ishaq, Sirat Rasul Allah. Translated by Guillaume, A. (1955). The Life of Muhammad, p. 79. Oxford: Oxford University Press. ^ Ibn Ishaq/Guillaume, p. 113. ^ Ibn Ishaq (Guillaume) pp. 309-310. ^ Ibn Ishaq (Guillaume) p. 203. ^ Ibn Ishaq (Guillaume) p. 309. ^ Alfred Guillaume's footnote to Ibn Ishaq (1955) p. 309. ^ Tabari, Tarikh al-Rusul wa'l-Muluk. Translated by McDonald, M. V. (1987). Volume 7: The Foundation of the Community, p. 68. Albany: State University of New York Press. ^ Ibn Ishaq (Guillaume) pp. 546-548. ^ a b Tabari (Landau-Tasseron) pp. 24-25. ^ Ibn Saad, Tabaqat vol. 8. Translated by Bewley, A. (1995). The Women of Madina, p. 194. London: Ta-Ha Publishers. ^ Ibn Ishaq (Guillaume) p. 311. ^ a b Ibn Hajar, Isaba vol. 8 #11586. ^ a b Ibn Hajar, Isaba vol. 2 #1904. ^ Beheshti, M. (1967). Background of the Birth of Islam, chapter 5. Translated by Ayoub, M. M. (1985). Tehran: International Publishing Co.
^ Majlisi, Hayat Al-Qulub vol. 2. Translated by Rizvi, A Detailed Biography of Prophet Muhammad (saww), p. 1180. ^ Ibn Hajar, Isaba vol. 5 #7129. ^ Tabari (Landau-Tasseron) p. 201. ^ Ibn Hajar, Isaba vol. 5 #6279. ^ Ibn Hajar, Isaba vol. 6 #8329. ^ a b Tabari (Landau-Tasseron) vol. 39 pp. 75-76. ^ a b See also Majlisi (Rizvi) p. 1208. ^ Tabari (Landau-Tasseron) vol. 39 p. 25.